Good news! The Secret Recipe Club is back! We took a break in January, but are now back in action. If you’ve missed my other SRC posts, the premise is this: you’re assigned a different member’s blog every month. You visit their blog, choose any recipe you want, then make it and share it on your blog. It’s a fun way to find new blogs and be stretched to try new recipes, cooking styles, etc. Then, everyone posts about their assigned blog on the same day. It’s so fun–if you have a blog, definitely check it out and consider joining. This month I was assigned Raina’s blog, Connor’s Cooking. Raina is a busy mom of four, but she still manages to find time to blog multiple times per week about the recipes her family loves. So impressive! Her kids seem like very adventurous eaters–I don’t know many kids who would eat Stuffed Pepper Soup or Cajun Shrimp Skewers. Everything on her blog sounded amazingly delicious and not all stereotypical kid food [though some kid food is excellent!]. After perusing her blog, I could hardly decide what to make–everything sounded so good. So, I left the choice up to Ben and he decided on Mexican Chicken Alfredo. 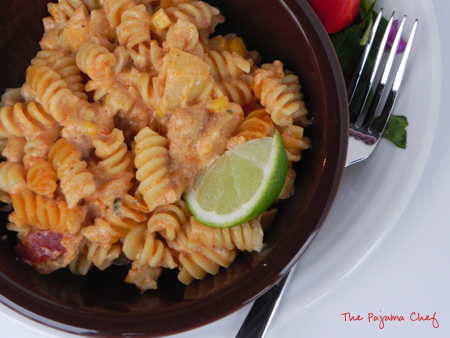 Think spicy chicken in a creamy Alfredo sauce tossed with tender noodles, salsa, and corn. What’s not to love? Plus, it was easy to mix everything up in a big skillet on the stove and pour into a casserole dish for baking. My kinda comfort food, for sure. 🙂 I didn’t make a lot of changes to the original recipe, but did use homemade taco seasoning and homemade Alfredo sauce, both of which I highly recommend if you have time. If not–no worries. It was the weekend, and I was feeling ambitious. But don’t be afraid–the ambition part is more time-related than anything. 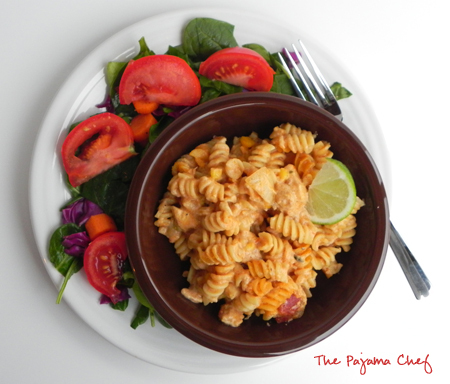 The Alfredo sauce isn’t something to be intimidated about–it’s really quite simple, and lends itself well to Raina’s Mexican Chicken Alfredo miracle. This recipe is definitely a keeper! Thanks, Raina! Begin by bringing a large pot of salted water to boil and preheating the oven to 350 degrees. Next, begin on Alfredo sauce. Melt butter in a medium pot over medium heat. Add garlic and cook, stirring constantly, for about 2 minutes. Add cream cheese piece by piece, stirring until smooth between additions. Mixture may appear curdled, but keep stirring. After about 3 minutes, you’ll be rewarded with a smooth paste. Next, slowly add a total of 2 cups milk in 1/4 cup increments. Make sure the milk is fully incorporated before adding the next 1/4 cup. Then, stir in 1 cup parmesan cheese and 1 teaspoon pepper, mixing until cheese completely melts. Cook for an additional 2-3 minutes to thicken, then cover and remove from heat. By now, the pasta water should be boiling, so add pasta and cook according to package directions. While the pasta is cooking, begin on the chicken. Heat oil in large skillet over medium heat. Add chicken, onion, remaining 1/4 teaspoon pepper, and 2 tablespoons taco seasoning to the pan, stir, and cook until chicken is no longer pink. Then, pour in Alfredo sauce [if it’s homemade, give it a good stir first] and bring to a boil. Add remaining 1/4 cup milk, remaining 1 cup parmesan cheese, remaining 2 tablespoons taco seasoning, salsa, and corn. Mix well, then pour into an ungreased 9×13 inch baking pan. Notes: If not using homemade Alfredo sauce, substitute 30-32 ounces prepared Alfredo sauce. Original recipe also suggests dividing meal in half; baking one now and freezing one portion in a 8×8 inch pan for up to 3 months. To use frozen casserole: thaw in fridge overnight, then remove to counter top for 30 minutes prior to baking. Cover and bake at 350 for 50-60 minutes. I love all the ethnic recipe ideas I get each month from SRC. This looks great. This looks really delicious. It is so much fun stepping into another bloggers shoes for a day. I always have such fun poking around my assigned blog. O, this would be a great alternative to spanish rice. It’s pasta! !